Strati - the think tank Institute for Strategic Analyses is starting publication of a new publication “Uncertain Ground. Engaging With Europe’s De Facto States and Breakaway Territories” by Thomas De Wall to keep its English-language readers informed of breakaway territories and opportunities for them to exist. A study of this uncertain territory calls for clear ground rules and terminology. To write about the issue is to enter a linguistic and conceptual minefield. Otherwise straightforward words such as “border” and “government” can become controversial. The leaders of the breakaway territories and their allies always use vocabulary that seeks to normalize their status by referring to their territories as countries with presidents, ministries, and embassies. The states that contest their status, generally backed by international organizations, tend to attach qualifiers to these words like “so-called” or “quasi” or simply add quotation marks. To live in an unrecognized state, observe Rebecca Bryant and Mete Hatay, scholars of Cyprus, is to have a “life in quotation marks.” In this report, the term “de facto” will generally be used to square this circle. There is now a rich academic literature on de facto states. Eiki Berg, Laurence Broers, Rebecca Bryant, Nina Caspersen, Giorgio Comai, Bruno Coppieters, James Ker-Lindsay, and Donnacha O Beachain have all contributed important work. Much less has been written for policy practitioners, a gap this report aims to fill. Perhaps the last significant large-scale study with policy recommendations was Dov Lynch’s Engaging Eurasia’s Separatist States, published in 2004. For international practitioners in 2018, this is a difficult and inhospitable field. The sheer inaccessibility of the places concerned is a deterrent. 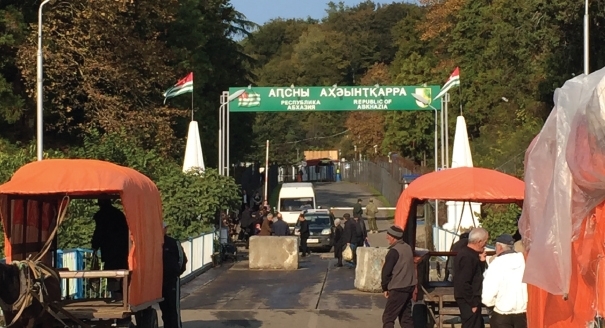 Most European and U.S. officials face difficulties in even physically setting foot in Abkhazia, for example, because of restrictions on both sides of the conflict line. This report uses three terms borrowed from the academic literature: de facto state, parent state, and patron state. Abkhazia, Transdniestria, and northern Cyprus will be called de facto states. The term refers to a place that exercises internal sovereignty over its citizens but is not recognized by most of the world as the de jure legal authority in that territory. In each case, the de facto state broke away from a parent state that is internationally recognized and still claims sovereignty over it: Abkhazia has broken away from Georgia, Transdniestria from Moldova, and northern Cyprus from the Republic of Cyprus. A patron state is the powerful military protector that supports and finances the de facto state. Russia protects Abkhazia and Transdniestria, while Turkey safeguards northern Cyprus. The characteristics of endurance and capacity for self-government qualify Abkhazia, Transdniestria, and northern Cyprus as de facto states for the purpose of this report. This distinguishes them from other territorial entities, which are also unrecognized and outside the international system and which come in many forms. There are two other categories, broadly understood, that will go unaddressed. One group comprises what could be called “ephemeral states,” the barely functional entities controlled by armed groups currently found in Libya and Syria, for example. These are more comparable to the quasi-states, such as the Kuban People’s Republic or the Gilan Soviet Republic that briefly flickered into existence during previous global crises and then disappeared into history. This category is also a better fit for the Donetsk People’s Republic (DNR) and Lugansk People’s Republic (LNR), the entities that have since 2014 administered territory in eastern Ukraine. Those two territories may coalesce into something akin to de facto states under certain circumstances, but currently their divergences from Abkhazia, Transdniestria, and northern Cyprus are more striking. A second pair of post-Soviet unrecognized entities, Nagorny Karabakh and South Ossetia, also fall outside this report’s consideration. They have elements of being de facto states, however, in terms of their economy, security, and civil documentation, both are much more internationally isolated and more closely integrated into their patron states, Armenia and Russia, respectively. The Nagorny Karabakh Armenians declared unilateral independence in 1991, but three years before, in 1988, they had begun their political movement by demanding unification with Armenia—which is still a popular option there. The South Ossetian leadership also aspires to join their bigger neighbor, North Ossetia, and, by extension, Russia. In both cases, isolation and de facto integration with the patron state go hand in hand—for Nagorny Karabakh, a hardline policy in Azerbaijan to internationally isolate the territory also drives the process. Thus, international engagement with these entities is so minimal that—for better or worse—there is currently little to say on the subject. In the years after the guns stopped firing, the conflicts around these territories have become contests for international legitimacy. Resolutions put by the parent states to international organizations, such as the United Nations (UN) or Council of Europe, ask that these breakaway entities be condemned as illegal. Pamphlets and blogs published in the de facto states assert the territories’ right to independence and separation. The international consensus around this almost universally supports the claims of the parent state over the breakaway territory. There are plenty of common sense reasons for this—but it needs to be stressed this is more of a normative political judgment than one definitively decreed by international courts. According to many criteria, the unrecognized entities can call themselves “states” in that they exercise real control over their own territories. “There has long been no generally accepted and satisfactory legal definition of statehood,” candidly asserts James Crawford, the author of the definitive work. The legal literature on what constitutes statehood grapples with the issue that states existed long before there was a concept of international law or diplomatic recognition. This ambiguity gives little solace to most de facto states, however. Diplomatic recognition is absolutely key, providing the entry ticket to the international club of states. Lack of recognition leaves the de facto states outside the door. The legal literature affirms that international recognition is a conscious political act. This should allay the constant concerns in the capitals of the parent states that lay de jure claim to these territories—in Tbilisi, Chișinău, and Nicosia—that greater engagement with a de facto state confers legitimacy on an illegitimate regime or amounts to a policy of “creeping recognition” that will set back the cause of reunification. These fears lead parent states to restrict certain kinds of international engagement with the breakaway territories. In Moldova, some have objected to measures giving Transdniestrians access to international education or travel abroad with official Moldovan documents different from those used by citizens in the recognized state, on the right bank of the Dniester River. In 2016, a group of Moldovan nongovernmental activists and experts published a letter objecting to the granting of “statehood elements of secessionist Transnistrian region.” These assertions speak to a fear that even halfway measures are legitimizing de facto authorities. Yet international legal experts are clear that this is not how state recognition works. Political scientist James Ker-Lindsay writes that “various acts could well be misinterpreted as recognition. In such instances, intent is crucial. To put it crudely, there cannot be accidental recognition.